Ayatollah Ali Sistani again urges unity in Iraq and calls for militias to lay down their arms and become loyal to the central nation. Ayatollah Ali Sistani calls for disarmament! The grand ayatollah said only the government should have weapons, and its forces should be loyal to the nation – not to individual political parties. Many Iraqis blame militias for a sharp rise in violence after the bombing of a Shia mosque in Samarra two months ago. According to Iraqi army sources, 21 insurgents were killed and 46 were captured after the insurgents stormed police stations and checkpoints near Baquba, 55km (35 miles) north-east of Baghdad. During a meeting in Najaf, the ayatollah told Mr Maliki he had to end bombings, drive-by shootings and kidnappings, fight corruption and restore electricity and clean drinking water. Ayatollah Sistani also urged Mr Maliki to form a government of leaders who would put the national interest above “their personal, party or sectarian interests”. The prime minister-designate has until late May to win parliamentary approval for a new cabinet, but has said he wants to move faster to create a grand coalition of majority Shia Muslims, Sunni Arabs and Kurds to combat the continued violence. “The dialogue is still ongoing with the different parties from which the government will be formed. God willing, it will be settled next week,” Mr Maliki said. This, of course is not the first time that the most revered religious leader in Iraq offered direction to the infant democracy. Al-Sistani represents the dominant theological school in the Iraqi holy city of Najaf, which rejects the Iranian model of rule by clergy. The Najaf clerics believe their role is to be spiritual leaders and not to participate directly in politics. In October 2004, the Ayatollah informed the fragile interim Iraqi government of his “full support” for democratic elections scheduled for January. 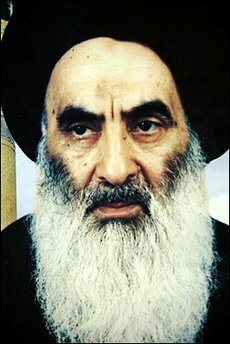 In September 2005, Ali Sistani promoted a “yes ” vote for the Constitution elections. In October of last year, Ayatollah Sistani, announced that he would not endorse any political groups for the December parliament election. He wanted Iraqis to vote according to their beliefs, and not according to his. Up until Wednesday of last week, after months of political logjam, the acting Prime Minister, al Jaafari, refused to step down from his post. Then Grand Ayatollah Ali al-Sistani, sent word that he should go. On Thursday, al-Jaafari gave the alliance the go-ahead to pick a new nominee. Iraq the Model has thoughts today on the formation of the new government. Democracy Project continues to write about the U.S. media’s inadequate coverage of the war and developments in Iraq explaining how inexpensive freelancers and locals are heavily used in reporting the war from a biased point of view. It’s a good read and was covered by Editor and Publisher.